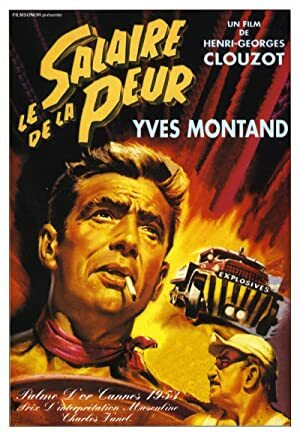 In this week’s episode, we take a look at Henri-Georges Clouzot’s masterpiece of tension, Le salaire de la peur, aka The Wages of Fear! We highly recommend you watch the film before listening to the episode, because this is a film you have to witness. This film is part of The Criterion Collection, so it can be found streaming on Hulu Plus, iTunes, and Amazon Prime, as well as on an excellent two-DVD/Blu-Ray set. If you are interested in how nitroglycerin actually explodes (or just what a nitroglycerin explosion looks like in slow motion), here’s a nice little YouTube video. 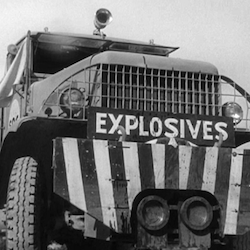 Please join us on October 7th when we visit John Frankenheimer’s 1970s remake of The Wages of Fear: Sorcerer! Plot: In a decrepit South American village, four men are hired to transport an urgent nitroglycerine shipment without the equipment that would make it safe.